This recipe represents a bunch of firsts for me. It was the first one I completely memorized, the first one I made for my friends, and the first one that comes to mind when I think of my childhood. 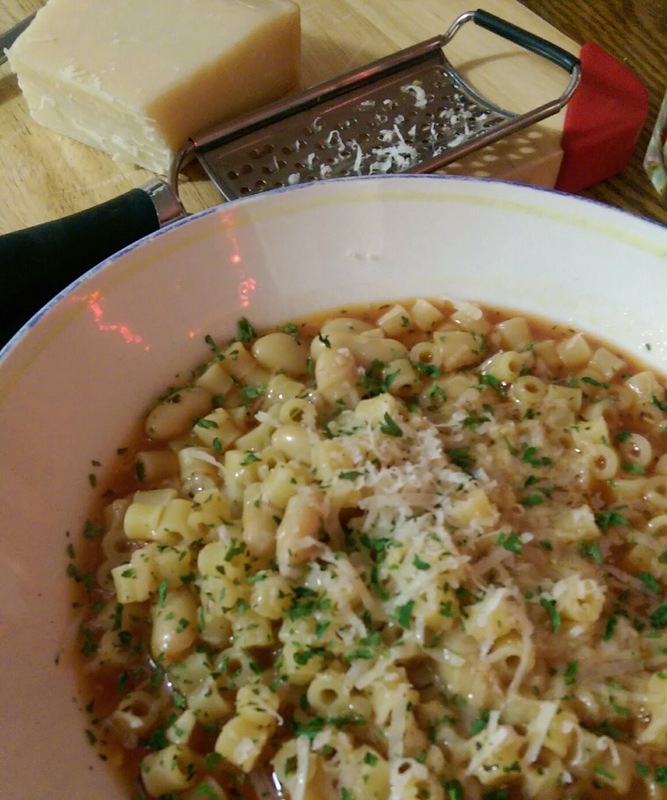 I thought it would be fitting for this recipe for pasta e fagioli (pasta and beans) to be the first one I share with you. Imagine a chilly, rainy, hectic Monday in the middle of November. Just an average day, but really crappy too. The kind of day where you'd rather curl up in a ball than do anything even minimally productive. The day's weather and mood is cold and bitter, and somehow at the end of the day, you seem to embody it. Then you walk into the house to see your mom cooking and the glorious scent of sautéed garlic inhabits your soul and melts your icy soul. Whenever I make pasta e fagioli, memories come rushing back to me of the lovely juxtaposition that can only be described as feeling nourished and sheltered inside when its horrible and ugly outside. It's wonderful. Even better, this meal is incredibly cheap, simple, and satisfying. parmesan cheese - the stuff in the green container is fine, but fresh is preferable. parsley - dried is fine, but again, fresh is preferable. Seriously. --See my post about storing fresh herbs if you're worried your parsley will spoil. Heat water for the pasta over highest heat in a medium saucepan. In another medium saucepan, pour in olive oil and heat over low/medium heat. While the pans are heating up, mince (chop very finely) the garlic. Fry the garlic gently in the oil until lightly golden. Stir in the water and tomato sauce, and add basil. Let the mixture simmer for 10 minutes. Stir in the cannellini beans and again simmer for 10 minutes. Stir periodically. Once you put the beans in, usually the water for the pasta has started to boil. Cook the ditalini al dente. Strain the pasta; do not rinse. Add the pasta to the tomato and bean mixture, take off the heat, and serve immediately. Add parsley and grated parmesan to your liking. Serving immediately is important because the more you wait, the more the pasta absorbs the delicious thin tomato sauce/broth stuff. This is inevitable and can't really be helped. Pasta that has absorbed the sauce can get unpleasantly (to some people) soft. To compensate for the first bullet, I like to keep the pasta separate from the rest, and store it separately too. If you do this separation method, be sure to add some olive oil to the pasta so that it doesn't stick together. When heating up leftovers in the microwave, adding a splash of water will help to coax that absorbed sauce out of the pasta. Perfect recipe on a cold New England day! Good tip! It would certainly make it a little thicker. To make it more like a soup, I would even feel comfortable adding two cups of broth instead of water without fear of watering it down.